Musa ornata is a small banana plant native to South Est Asia that grows to 9 feet and similar to Musa velutina. The plant will stay smaller if grown as a container specimen for cooler climates. Can be used in tropical cut flower arrangements. 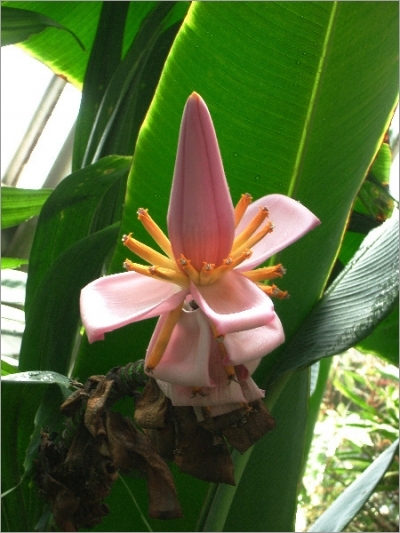 A very attractive ornamental having a flowering inflorescence of very bright pink. The flowers are 3-5 inches in each bract, yellow to deep yellow-orange. Blooms appear year-round. Extremely quick to flower, can flower when only 3 feet in height. This small species has long and narrow, glaucous green and often mottled leaves. Underside of leaves is usually a maroon color. Leaves are up to 2 meters long and 35 cm wide. The fruits are 3 inches long, 3/4 inche in diameter, pale greenish-yellow with white pulp, inedible but attractive.